Have you sewn on a Juki household machine? I ask because the model you show is - in my opinion - quite nice. It resembles an industrial Juki in design, which will make it easier to transition to a heavier machine, later. It also looks like a single-needle lockstitch. And, I love that it has a knee lift - I haven't seen that on a household machine, before. And, I tell you, it's the number one reason I don't like sewing on household machines if I can help it - I really like keeping two hands on the work! We don't get that sort of Juki machine in Germany. The shops only carry the regular brands like Pfaff, Husqvarna, Brother, Bernina and alike. I have a household zig-zag I use for buttonholes and bar tacks, but the rest are industrial machines I found on Ebay. The main distinction between the household machines is the hook. There are some with an industrial like hook(Umlaufgreifer), while the majority of the cheap ones have a "swing forth and back" version, which is much slower(Schwingspulengreifer). I like Juki machines because they are very reliable. the owner of a sewing company told me that they are better than Pfaff machines, and that meant something in those days. Today most industrial machines are made in China, even the top brands. The lower price is a good indicator. What does a tailor use zigzag stitching for, besides finishing buttonholes? When constructing the canvas, the cuts (or vees or fishes, whatever) can be sewn with a zig-zag machine using a large stitch. Some tailors use a plain machine rather than zig zag but I would rather do it by hand than do it by plain machine. Still... nothing beats a single-needle industrial machine. If your livelihood depends on sewing, this is the best investment ever. Single-needle machines are cheap. Used ones can be had for <$500. Just don't get a cheaply made brand. Juki and Singer (both made in Japan) are my preference. Industrial Pfaff is a close second. I've never sewn on a Durkopp-Adler. I'm told those are considered the "cadillac" in the trade - I've only ever seen them at trade shows. The Durkopps are great machines but it's tough to get parts. Pfaffs can sometimes be touchy too- not all their parts are universal; I like Brother and Juki for that- the most commonly available presser feet all fit on the Brother and Juki machines. In industrial machines, the convenience of a thread cutter is nice when you have a lot of work to do, but it's not the cleanest finish (messy when making pockets) and it's one more part to break so for home use I would suggest a machine with no thread cutter. Tacking functions are also not a necessity. I'm a home sewist and I've got several. A Bernina 930 which I like because it has a narrow part that is easier to get a cuff or into smaller areas. It's mechanical. A Bernette serger 334DS which just means it has differential stitching to counter the waviness in knits. It's all metal, made in Japan and has incredible stitching. Takes regular sewing machine needles. These machines are from the 80"s and I try and take good care of them. My new machine, a Viking 770, computerized and my main machine now. It's made in Sweden and a dream to sew on. My 930 is made in Switzerland. The 930 just has one buttonhole type, but the 770 has at least 9, and you can do a light or heavy one on different types of fabric. My new serger is a Viking 936 computerized, sort of a package deal with the sewing machine. It's larger than the average serger but can do quite a lot, including coverstitching. Takes regular sewing machine needles. I also have a Viking 100 mechanical that takes a lot of the same feet as the 770. It was made in Sweden too. I got it from a girl who took a quilting class and didn't want it anymore. A Singer that just does straight and zig zag. Nice straight stitches but I rarely use it. My vote would be for Bernina or Viking. If I sew on natural fabrics, I tend to like the feel of the Bernina. The 770 is equally as good, but the Bernina just feels powerful and confident. Peerless is liquidating machinery- if anyone is looking there are probably some very good deals to be had. This is what I read from The Complete Book of Tailoring by Adele P. Margolis, 1964, 1978 (I'm just a housewife, homesewist.) Her book is for the homesewist. "Tailoring requires only a simple, straightstitch sewing machine in good working order. It need not be the newest or most complicated model. That is not to say the newer machines are not fun to have. From the standpoint of tailoring, it's not the fancy stitches that make them so appealing. (The only really useful one is the zigzag stitch.) It's their more powerful motors that make it possible to stitch all types of fabrics more effectively." I was thinking that tailors may need to stitch through all sorts of padding and layers of wool. These things never occurred to me when I typed in my machines. I think that is still sound advice for both the serious hobbyist as well the professional. However, the moment you step foot in a store, they are at you selling you the fanciest computerised model they have (just in case you want to take up quilting). The more sophisticated the electronics, the harder it will be to repair years down the track, and the more compromised the quality of the mechanical moving parts will be. I'll go a little bit further. When you buy a household machine, you have to prepare to have it in the shop at least twice a year for routine maintenance. The problem is, you're at the mercy of the mechanic. Now, in an industry setting - where the mechanic comes to you - you're still at their mercy. But (!) and a very important distinction, here. Mechanics who work on industry equipment know in their heart-of-hearts that your livelihood - and, by virtue, theirs, too - is at stake. So, they tend to hustle a whole heck of a lot faster. I've been down this road more times than I care to count. If your livelihood depends on it, you need to stand firm for what you will and will not tolerate as a business owner. Speaking only for myself: as much as I love the Husqvarna brand, there's no way I could ever wait 2 weeks for a mechanic to eventually get around to servicing my principle machine. Buying two isn't the answer, either. Well-built industry equipment is reasonably priced, extremely durable and cheaper to maintain. I just had my mechanic in for my quarterly tune up. He tuned and repaired 3 single needle machines, a lockstitch buttonholer and a 4-thread overlock in less than 4 hours and charged a sum total of $224, including parts. Next, he'll replace a couple parts on my keyhole buttonholer, tune/repair the 5-thread overlock, and also tune/repair 4 other machines machines. That will probably take about 8-10 hrs to accomplish and - with parts - cost another $400. To clarify: I maintain 12 machines, 4X each year for ~$650 each visit; and, the mechanic comes to me within 2 working days of calling him. In contrast, my Husqi costs $120 every 6 months (even though it rarely sees any use) and waits 2 to 5 weeks in the mechanic's queue for its 30 minutes of attention. It takes about 6 weeks for the Bernina and the Viking 770. While on vacation this past week, I was given a Singer 237 in very good condition. I ordered a copy of the instructions and a service manual so I could begin to look it over myself. I sent it to the Singer man first though. I did play around with zig zag buttonholes, and it's fairly easy to do. I've not tried quilting yet. I'm committed to working with pattern drafting now, and I want to explore tailoring more. I will say in my study, I'm getting more respect for tailors. I'm finding out all the girls who have had some serious training love the industrial. I would wonder if they miss the ability to zigzag in tailoring, or is that not done at all? It is hard to figure out which machine is best for a given price. Even the top brands produce in China to offer cheaper machines and in most cases they are of inferior quality compared to the "originals". They somehow lack the precision of parts and assembly. We have 3 new Pfaff machines, one with a label "Made in Germany", the others without. Those 2 are really nasty to use, adjusting thread tension is tricky and the needle is not correctly centred. Zig-zag machines were very popular in tailor shops here in Germany with the main model being a Pfaff 138, which is a very robust and versatile machine. The only problem with Zig-zag is the stitch plate having a wider hole than a straight stitch. Doesn't cause much trouble when sewing thick materials, but with light and thin ones. Zig-zag's were used to secure the edges if an overlock was not present (sewing machines were extremely expensive in the olden days) and for a few other purposes, which varied from tailor to tailor. In general I'd prefer a good used machine over a new one with (too many) fancy features. A knee lever is more useful than being able to stitch monkeys and giraffes. A knee lever is more useful than being able to stitch monkeys and giraffes. Ha! I love that!! It's very true, though. In addition to this, historically zig-zags were used to attach binding. Here is my machine, a Pfaff 360 Auto. Although not considered "industrial" it is a work horse. It's heavy enough at full steam not to hop across the table, it has a free arm (which is handy for tight work), and is tough enough to cleanly go through multible layers of coatings without binding. I have also used it for leather and buckram which it glides through like butter. Having said this the only draw backs in my opinion are the thread tensioner is a bit antiquated and can be fickle with thinner materials and the foot lever is on the back side. None the less a hardy machine that is us for anything you throw at it. what do you all think of a Pfaff 130 or a Kenmore 117.959 (rotary) machine? i won't be doing anything other than making dress shirts, bow ties, and maybe a suit or two every year or so. i already have the rotary machine and its in excellent shape and has all of the attachments. 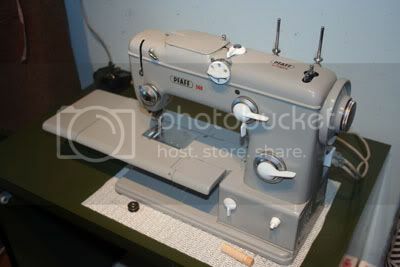 i hear good things about the Pfaff and they are on ebay pretty often. I've not used a Pfaff 130, My wife and I have a Pfaff 115 (hand crank) and a 230. In my opinion any of the earlier "iron" Pfaffs are solid work horsesand you can't go wrong. It's interesting to hear things from a more "business"/industrial perspective. I'm just a home-sewer, and I have a Singer 15-91 (built c. 1933) that I got on eBay for $20 (total, local pickup) and had fixed up for about $60. It's often mis-advertised as an "industrial" machine. It's simply a sturdy home machine. It does straight stitch - that's it. It has attachments available, and I have some of them. I haven't yet given it something to sew that it couldn't handle. I'm thinking of making a topcoat in the future, so we shall see. It requires oiling (recommended every 40 hours of use), but this can be accomplished by the owner - Singer even has the old handbooks on its web-site still. I am a machine junkie and have several. What I have read about maintenance fees are also very true. Having a home or industrial machine repaired and or serviced can turn into a racket and a money pit. From a business perspective, I guess it all falls under the "cost of doing business". Domestic cut and sew operations are far and few between, especially in my part of the world. (Domestic as in the opposite of international, not domestic as in home) Personally, I make a distinction between home machines and industrial machines by the way they are set up. Often times on eBay you see "industrial grade machines" and they are simply a home model with above average construction or simply have the ability to do light upholstery or denim work. The traditional "industrial" machine usually mounts in a table and attaches via a drive belt or chain to a large motor, such as a two phase half hp clutch motor. For someone that is running a small scale alteration business, or making a limited amount of MTM or bespoke garments, a nicer home machine will suffice in my opinion. I use the general rule of thumb to oil the ports of the machine once for every 8 hours of machine use. If someone is talented enough to draft patterns and make clothes, there is a good probability that they can maintain their own machine within reason. Singer has many open source documents available for online download. Depending on what you want to make, a simple lock stitch machine with adjustments for stitch length, tension etc will work. If it has zig zag, needle position and stitch width are standard adjustments that can be set easily. I would recommend a machine that wound its own bobbin, as putting bobbins on winding arms attached to the hand wheel can be tedious and consume time. In specific address to the Pfaff 130, I have one and it works well. It is a well made machine and if you can find one that has been properly maintained, it will serve you well. It can however be a ticky machine and the vertical bobbin can be hard to time just right. Opinions vary widely on Singer Touch and Sew models, but for something that was made in the 70's and can be found on craiglist or eBay for under $100, it has the potential to be easily worked on by the owner that is handy with a screwdriver and parts are readily available. I have a 700 series touch and sew and the main elements that will go bad are the gears and timing belt. I could walk you through those repairs or refer you to manual sources. I digress. In summation I dont think there is a machine that would work for everyone across the board. Many hobbyists and home sewers seem to use the machine that they inherited or found inexpensively. Old all metal black machines have always had some allure and intrigue to me. Singer featherweights are one of the few machines that hold value and seem to command premiums in good condition. They are portable and a favorite of quilters and teachers that travel to workshops. I see good clean ones go in the $400 range. i have learned many of the same things you have in my internet driven education and search for a workhorse sewing machine. i wish i had done more research before i purchased my Kenmore rotary machine. don't get me wrong, its virtually indestructible with its all metal gears and simple design; thus far i haven't had any problems. the only hangup is i wish it had a zigzag stitch, but i don't think it will prove to be an insurmountable challenge to get along without it. parts for it are hard to find, but not impossible to get. it should serve me well until i can clear space in my basement tailoring room for a bigger machine, such as a singer 15-91 or something similar. the great thing about it is that i only paid $15 for it at a thrift store. i don't spend countless hours sewing so it will last a lot longer than i expect. and really, its already lasted 50+ years, so my quest for a better machine is not really need, but moreso want. I have mine in the table still, but it doesn't take up that much space in my small bedroom. The 15-91 doesn't do a zig-zag stitch, though I haven't needed one enough to buy the attachment (which works for any low-shank machine), which seems to go for $10-25. It works by moving the fabric - instead of having the needle move. I don't know how reliable it is, but I saw the buttonholer that worked on a similar concept, and it performed well.